Is your dog itching, scratching and chewing at his skin? Is it keeping you up at night? If so, you are not alone. Skin problems are common in dogs, but they can be caused by a variety of things. To learn how you can help your itchy dog, your best option is to figure out why he is having skin problems in the first place. Fortunately, even if you cannot get to the bottom of the itching right away, there are some things you can do to help. Itching, medically known as pruritis, is a symptom of many different types of skin issues. Often, the itching can be traced back to some type of allergy. There are some non-allergic skin issues as well. It is up to your veterinarian to diagnose the exact cause of your dog's pruritis. Fortunately, you may be able to make certain changes to your dog's environment, lifestyle and routine care to help control the itching. 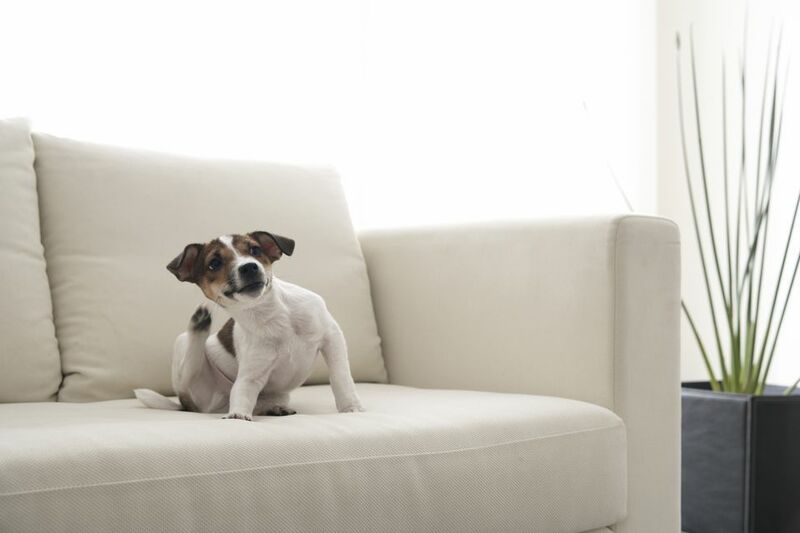 Before we talk about other allergies, we first must discuss the most common reason dogs itch: fleas. These tiny parasites can live on your dog's skin beneath the coat. Fleas survive by biting the dog and ingesting its blood. Not all dogs seem bothered by fleas. This is because some dogs are not actually allergic to fleas. However, most dogs itch when they have fleas, which means they are allergic to flea saliva. Flea allergies vary in severity. Some dogs experience only mild itching when exposed to fleas while others develop intense itching from just a few flea bites. Every dog should be on flea prevention. However, if you have an itchy dog, do not take any chances: make sure your dog is on the best flea prevention available all year long. Ask your veterinarian about the right flea prevention product for your dog. Fleas eventually develop immunity to flea prevention products, so new products are constantly emerging. What worked to kill fleas a few years ago might not necessarily work today. Itching in dogs is commonly related to allergies. Flea saliva is just one of many dog allergens. Dogs can be allergic to virtually anything in the environment, such as dust mites, dander (cat, human, etc), pollen, grasses, mold spores and more. Many dogs have seasonal allergies. These are most likely caused by pollens and other outdoor allergens that change with the seasons. Dogs can also be allergic to ingredients in dog food, such as chicken, beef and various grains. Some dogs only experience mild to moderate reactions to various allergens and respond well to treatment. Others suffer from a more serious allergy condition called canine atopic dermatitis and may require more intensive therapy. In addition, your vet may recommend allergy testing to determine the sources of your dog's allergies. Allergies, scratching and chewing may cause inflammation, potentially leading to secondary infections (especially bacterial and yeast infections). Irritation and secondary infection can occur on the skin and feet, in the ears and even in and around the eyes. Once a skin infection occurs, the dog often needs medical treatments such as antibiotics, antifungals, steroids, topical treatments, medicated shampoos or even more. Depending on the severity of the skin infection, it may take a long time for the dog to recover. This is why it is important to regularly discuss your dog's health with a veterinarian. If possible, bring your dog to the vet during the early stages of itching, before the skin looks affected. Letting skin infections get out of control leads to the need for much more time and effort to treat the infection. Your dog's itching might not be related to allergies, but to another skin condition. Parasites such as mange (demodex, scabies) may be the cause of the itching. Certain autoimmune or other metabolic conditions can cause itching as well. The treatments for these conditions are potentially much different that the treatments for allergies and secondary skin infections. This is why it is so important to visit your vet if your dog is itching persistently, has hair loss, or if the skin has an abnormal appearance (redness, scaling, flaking, bumps, etc.). There are some ways you can help control itching and allergies in your dog. There are often little things you can change at home to prevent or alleviate mild itching before a secondary infection develops. Sometimes, however, you will need your veterinarian's help. Learn about the best ways to prevent and manage allergies in dogs.